Lobuche Peak climbing is one of the famous trekking peaks in the Himalayan country of Nepal offering an attractive summit and several trails for climbing. 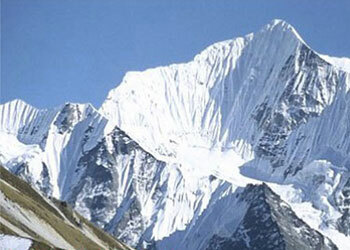 Lobuche Peak lays close to Khumbu Glacier provides an attractive climbing summit. Lobuche peak climbing offers panoramic Himalayan views of Everest region, beautiful landscape, Tibetan Sherpa culture & Monasteries. Offering a variety of existing routes and broad scope for new lines, Seen from near Lobuche, the dark triangle of its rocky east face rises above the moraines of the Khumbu Glacier to and icy skyline. Lobuche peak climbing offers panoramic views of Himalayan peaks like Everest (8850), Nuptse, Lhotse, Makalu, Baruntse and Ama Dablam, Cholaste, Thamserku, Kantega peak and Tawache peak, etc. The mountain is also known as the ‘False peak.’ The Lobuche peak climbing offers you enough opportunity to enjoy the fantastic view of Mt. Everest including several other similar peaks and explore the Buddhists monasteries and shrines along with extraordinary wildlife. Lobuche peak climbing journey starts from Lukla Then we follow the Everest base camp trekking trail to reach the Lobuche peak base camp and set up base camp for upcoming summit. Lobuche peak climbing trip follow through lush valleys, Sherpa village, Namche Bazaar, Tengboche, Pheriche, Lobuche, Gorakshep to finally Mt. Everest base camp then summit to Lobuche peak. We descend to the Imja Khola and continue to the villages of Pangboche and Pheriche before finally approaching the Khumbu Glacier. Heading Lobuche is a vantage point for some spectacular views of Ama Dablam, Taweche and breath-taking sceneries second to none. Rugged mountains of the north, long and treacherous walk up and down the hill going to meet the pleasant end with a warm welcome and homely environment makes you forget every struggle of the climbing of Lobuche Peak. Lobuche Peak climbing offers an ample chance to explore the beautiful forest, farming countrysides, several monasteries, enjoy unique culture and golden opportunity to chase your dreams of marvelous Lobuche mountain climb along with the most magnificent Mt. Everest itself. 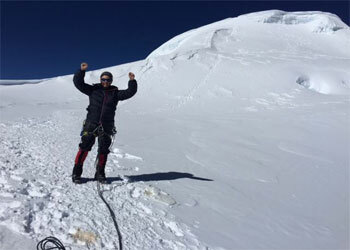 For real adventurers looking for a challenge something more than trekking, Lobuche peak climbing is one of the best for climbing steep snow and ice slopes using fix ropes and access to the summit overlooking Lobuche and the Khumbu Glacier. From Phakding the trail follows the Dudh Koshi valley north, meandering through the pines, crossing it twice by small suspension bridges before reaching the village of Monjo the entrance gate of the Sagarmatha National Park. Villages are interspersed with magnificent forests of Rhododendron, Magnolia and fir. Along the way to you will be rewarded with your first glimpse of Kusum Kangru (6369m) Thamserku (6608m), Everest (8848m) and Nuptse (7879 m). A steep climb up to the beautiful village of Namche bazaar (3440m) will afford you further spectacular views and a comfortable place to spend the second night of the trek. Set in a natural amphitheatre looking across to the jagged ridge of Kongdi Ri(6187m), Namche Bazzar is one of the most attractive settlements in the khumbu region. Today we make a short acclimatization trek up to Khumjung, a delightful Sherpa village above Namche. 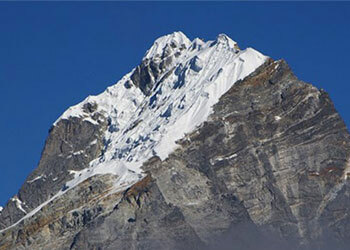 You can also enjoy the splendid views of Everest, Ama Dablam, Thamserku, Nuptse, Lhotse, Tawche, and Kwangde and so on. We follow a spectacular path that traverses around the hillside high above the Dudh Kosi River. After walking one hour you will arrive in Phungithanga. The trail climbs past some water-powered prayer wheels and begins a sustained climb through a forest of tall, mature rhododendrons. 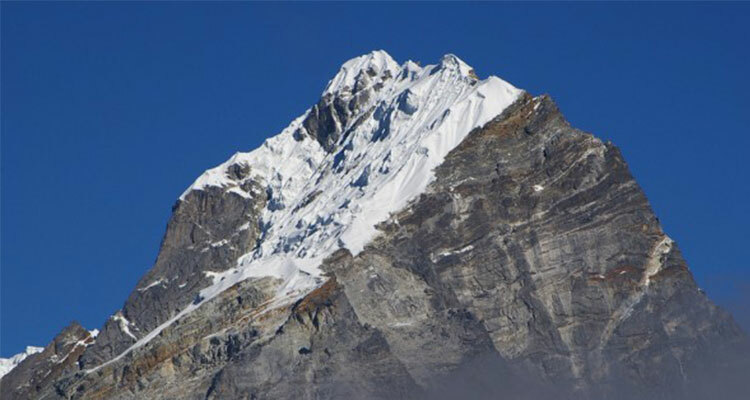 The start of the Tengboche (3870m), the village is scattered across a wide, grassy saddle below a crescent-shaped ridge covered by scrub pines and firs. From the view point at the top of the hill, there are awe-inspiring views of distinctive peaks like Amadablam (6856m), standing proud of the massif containing Everest (8848m), Nuptse (7861m), Lhotse (8501m) and inspiring views of Himalayan giants. We visit the Buddhist Monastery at Tengboche, the largest in Khumbu region. In the morning views of mountain and monasteries are spectacular in Tengboche. From Tengboche follow the trail as far as Orsho and take the lower path along the west bank of the Imja Khola, through the forest of birches conifers and rhododendrons. As we follow the river northward the trails pass through several chortens and mani walls and small villages. Today’s walk offers views of the Mt.Tawache, Ama Dablam and to the north-Pokalde (5741m), Kongma-tse (5820m) and the great wall of Nuptse. Dingboche is also the gateway to Chukung and farther beyond for the most challenging traverses towards Makalu area. We enjoy the beautiful array of fields enclosed by stone walls to protect the barley, buckwheat and potatoes. Overnight stay in Dingboche. It is very important to spend an additional night here to aid to the acclimatization process. It can be along a short hike 400 m climb to the Nangkartshang Gompa on the ridge north of Dingboche. Good view of Makalau (8463 m) from here. You can go for a day walk like trek to Chhukung (4,730m) is worth while which takes approx. 4/5 hours from Dingboche but it might ruin your rest. To the north of Dingboche, there are spectacular views of Lhotse’s huge South Face. The trail follows a downward path to Pheriche village. It joins the trail below thungla beautiful views of cholatse across the valley. After another steep ascend the trail climbs up and over the terminal moraine of khumbu glacier. The path follows a pleasant, grassy valley. Stark and rugged beauty creates almost moonscape campsite at Lobuche a wind swept collection of huts tucked in a narrow meadow between the glacier and the Lobuche peak. Tawoche and Nuptse are particularly spectacularly from Lobuche towering. Stay overnight at lodge. Mornings are usually sparkling and clear and this is the best time to climb the Kalapathar for one of the world’s definitive mountain views. 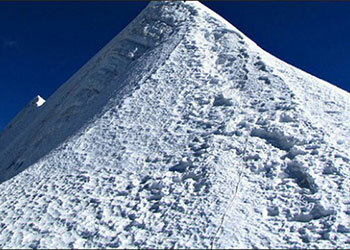 We will be rewarded the 360 degree dramatic panorama views of Mt Everest and surroundings mountains like Mt. Pumori, Mt. Lingtren, Mt. Khumbetse, Mt. Nuptse, Mt. Lhotse, Mt. Ama Dablam, Mt. Thamserku along with many other peaks. You will have an easy walk for about 2hrs to reach Lobuche. Stay overnight at lodge. The trek from Lobuche village toward the Lobuche Base Camp starts out with a gradual incline at a relatively low altitude and quickly becomes steep and rocky when we reach teh Lobuche Glacier. You will catch panoramic views of Everest, Lhotse, Nuptse, Ama Dablam, Tawache, Cholatse, Pumori, Changri and more. Climbing guide will provide training on peak climbing techniques and using climbing gears. This training is necessary for your safety and will make your climbing experience more enjoyable. It is very important to spend additional nights here to aid to the acclimatization process before climbing to the high altitude peak. We will spend two days just exploring around the places, clicking the views and enjoying the climate. We would enjoy arresting panoramic views of Everest, Lhotse, Nuptse, Ama Dablam, Tawache, Cholatse, Pumori, Changri etc. After breakfast, we begin the strenuous hike from Lobuche Base Camp to the Lobuche High Camp, 5600m. Following the rocky moraine path we see the incredible sunset on the mountains from the high camp. Today we will get one of the best views of the greatest mountains in the world: Everest, Lhotse, Nuptse, Ama Dablam, Cholatse, Pumori, and many more. After a Successful summit return back to Base camp. Today our trail goes downward towards Pheriche and Dingboche passing Duglha. Dingboche offers the beautiful views of Mountains. The spectacular views can compensate you tiredness caused by such a long period of trek. The route ascent through the terrain fields of meadows and dwarf rhododendron forests. From here, the walk is fairly moderate as we enter the Imjatse Valley. Stay your night at Tengboche. There also lays the oldest monastery founded in 17th century. Have some interesting accommodation alternatives.after lunch continue trekking to Namche of Pheasants, Himalayan Griffons, Musk deer and wild goat can be found abundance inside the rhododendron forest. Evening explore small surrounding area with magnificent scenery. Today is free or last minute you have few hour special shopping for your relatives. We will drop you to the International airport to catch your flight back to your home and wish for your Safe journey.